For those who may not know, Dia de Los Muertos is a holiday in South America and Mexico where people honer their deceased ancestors and celebrate their lives. Today its widely known throughout the world and is often associated with the skeleton makeup, parades, and parties in places touched by latin culture. Originally the festivities took place earlier in the year, but with the influx of european culture and catholicism in the Americas the date was changed and set to the fall to coincide with other similar holidays. Dia de los Muertos is now celebrated over a 3 day period beginning on October 31st. <a href="http://www moved here.sanchosmexican.com/menu”> Before the Spanish arrived in america, the Inca had a culture that was deeply connected to their ancestors. The bodies of their important honored dead were often preserved and kept as a kind “huaca” or token representing something revered. This was not the only thing used as a huaca however. They could be anything symbolizing something important. For example a special rock that symbolized an important river may be enshrined. It was a general term for a symbol of importance, and some of the most important things in Inca culture were their ancestors. The bodies of previous rulers would, for example, would be left on their throne and treated as if they were still living. They would be taken to parades and celebrations, honoring them. Unfortunately most if not all of them were destroyed or lost by the Spanish when catholics saw the practice as unsettling. The culture carried on however, and had an impact on the way holidays were celebrated moving forward. 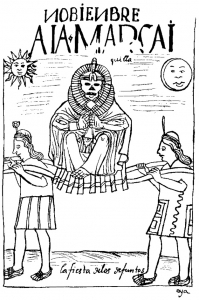 This sort of cultural reverence for the dead was common not only among the Inca but the Aztecs as well, though perhaps in slightly different ways. 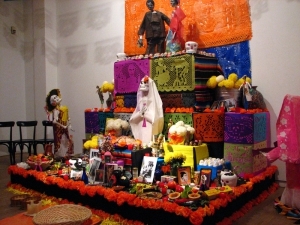 The general idea of ancestor worship carried over throughout the americas and eventually has influenced the world. Today, we celebrate the lives of our ancestors with Dia de los Muertos. Perhaps we don’t parade the bodies of our ancestors through the streets, but there are several other symbolic activities observed by those who participate in the holiday. The first major day of the holiday is November 1st and is the Día de los Inocentes. This day is often set aside to honor lost children or infants. November 2nd is the Día de los Muertos, honoring all others as well. Typically a shrine is built and offerings are made to the fallen. These offerings are things that could be useful to them in the afterlife or along their journey. They are usually flowers, favorite foods, breads, alcohol, candles, poems etc. and all have symbolic meaning. The belief is that we should not mourn our ancestors but instead celebrate their lives. In that light, people gather for massive parades and parties for the Dia de los Muertos. The parades are filled with people in costume, floats, flowers, and banners, all themed with the iconic almost baroque folk art skulls that are seen around this time of year. Wherever you are on Dia de los Muertos, you will almost certainly find a celebration. The culture and traditions of Mexico and South America have permeated into cultures from all over the world. And of course there are other celebrations and traditions around this time for almost every culture. Its a special time of year when the weather is changing and the air seems thinner yet alive. We should reflect on those who came before us and enjoy our time here, knowing that those who follow us will celebrate our lives when we are gone. Come celebrate with Sancho’s Mexican!